It’s one incredible testament to the vitality of the Texas music scene that a young troupe of musicians from Lubbock playing short-run tours in between college semesters can do so well for themselves that they’re headlining festivals and receiving millions of plays on their songs, and all without a legitimate record label. While many Nashville Americana acts and up-and-comers get showered with praise from the press with little proof of concept, Flatland Cavalry is upgrading to a tour bus before they receive their diplomas due to the reception they’re finding among appreciative fans, and the respect they’ve earned from their and peers and elders in a region where songwriting, honesty, and authenticity come first. 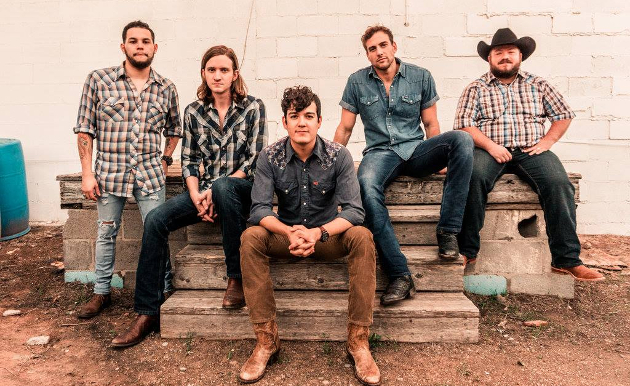 Just as bands like the Turnpike Troubadours certify their dominant status by getting national opportunities, a band like Flatland Cavalry comes along to take their place as the next great thing, feeding the music scene with fresh blood. Similar to Turnpike, Flatland Cavalry carries a more country rock sound compared to the straight-laced honky tonkers, yet the strong presence of fiddle keeps the music firmly grounded in its Texas roots, as does the songwriting that adheres to the elevated standards insisted upon by fans and peers. Their second album Homeland Insecurity is presented as one that should be regarded very favorably, but with a few initial concerns. Unfortunately there are some production matters that trouble the ear upon first listen. Frontman and primary songwriter Cleto Cordero is a fine singer, but that’s not the reason you listen to Flatland Cavalry. You do so for the songs and the melodies. But multiple times on this record, Cordero’s vocal signal is just a little too boomy, or wet, especially on the song “The Other Side of Lonesome,” which is a sweet little country tune, but one that sounds too watery to really get into. The next song on the album called “Back to Me” suffers a similar fate, while the guitar tone just doesn’t seem right, even if the parts themselves do. The entire record feels like it could have benefited from a slightly better production suite, including the sequencing of the songs themselves. The best material on Homeland Insecurity is back loaded, which is something the listener should take note of. If you’re worried the album sounds a little weird for you in some places, or light in substance early on, stick with it. Some will wonder what the loss of Flatland’s original fiddle player Laura Jane Houle has done to the outfit. It is a shame that she’s no longer around, if for no other reason than she helped legitimize the whole thing by her sheer, shimmering presence on stage. Whatever Laura Jane is on to now, she should feel confident that wherever life goes henceforth, her contributions to Flatland Cavalry were crucial to the initial formation and appeal of the band, and are greatly appreciated by fans. But new fiddle player Wesley Hall is filling in admirably, and singer, songwriter, and Cleto Cordero love interest Kaitlin Butts adds a female presence to this record in the form of harmonies, and semi-regularly joins the band on stage. By creating networks of fans, touring opportunities, local radio station support, and nationally-impacting festivals and events, artist who choose the Texas country scene don’t have to compromise who they are to see their musical dreams realized. 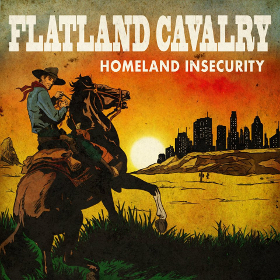 If Flatland Cavalry and Homeland Insecurity are any indication, than the future of Texas country is secure indeed. It is a great album but you are right that sometimes the audio sounds messed up. Some songs sound like they were recorded in the shower. I understand what they were trying to go for here, which was a lonesome, wide sound on certain tracks. But it just didn’t work. When done well, the effect can really enhance a song. Someone at some point should have executed some veto power and told them that a more straightforward approach would have been better. That said, the worst of it is isolated to a few tracks, and overall I think the album is great. I thought it worked on Marty’s album. Maybe 1or 2 too many interludes, but the production makes me feel like I’m alone in the desert. I think Marty Stuart’s “Way Out West” is an example of “space” done right. I think there’s also better examples, but it’s a good one. Yes, and Red Shahan’s album Culberson County is another good example of the lonesome sound being done right. Some of the production on this album is terrible. I enjoyed this album, and I agree- the better material is in the later part of the album. Stick with it, and you will be pleased! I totally agree with the production issues on this album. The Other side of lonesome is atrocious with its production. It sounds like he is singing into a tin can at the bottom of the Grand Canyon. Or on “Ashes” it sounds as if someone is choking Cleto while he is singing or he just had a kick to the groin. His voice didn’t need to be auto tuned but just polished some. Sometimes it feels like Cleto is standing right in front of you while the band is 20 feet behind and vice versa. It goes against the bands Motto which is “Easy on the Ears, Heavy On The Heart”. Its disappointing because there is not a bad song on this record in terms of written material. This album could have been a big breakout for them but I don’t see many people gravitating to this that were not fans before. I mean with good production this may have been an album of the year contender. There are so many great lines in the songs that stick with you to “I was lonely then you should see me now” to “Counting Constellations On The Popcorn Ceiling” or “If I could get out of this chair”. I love this band and songs like “Lonely Then”, “Years From Now”, and “Come Back Down” will be played this year til my ears bleed but I just felt disappointed cause I think of how great this record could have been. Hell maybe I am just hard on band because I thoroughly enjoy them and I see the potential in them. I would put this as a 7/10 I guess. I hope your stance on this Trigg will grow on me that maybe I will get used to the sound over time like you said happened to you. My favorite band right now. This album is going to be a strong contender for the best of the year. Great in-depth, comprehensive review, trig. Was definitely worth the extra wait. Overall I think the album is great. There are definitely some hitches in the production of a few songs but I think we’d all rather hear that than some egregious autotune, etc…. and again I think the overall album quality is so high that little issues in production can be overlooked. These guys’ (& gals’) music just has such a good vibe. Easy listening. does anyone happen to have a copy of Humble Folks on Vinyl that they’d be willing to part ways with? I went on their store yesterday to pick one up for the girlfriend and they had apparently just sold out. Would offer $$$!! yeah …like listening underwater at points . Love this record. Saw the band live for the first time not too long ago and the definitely closed a whole room full of people. I hope to see them on one of the many Texas/Red Dirt festivals here in Oregon this summer (three so far!!). Been through this album a few times now. Gets better with every listen. Very solid. Quick correction, Trigg — the song title is “Pretty Women.” One of the better tracks on the album. Y’know, when I first heard these guys a year or so ago, I wrote them off as Tunpike Troubadours-lite. I didn’t think they were bad in any way, but I didn’t get anything from their music that I couldn’t get from the Troubadours. I don’t know if they’ve come into their own or if my taste has changed, but I’m really liking what I’m hearing from them now. Very solid. One of my favorite new releases in a while. I am looking forward to more from them. I’ve been a BIG fan for about the duration of their existence thankS to their airplay on Lubbock’s KJDL. This was a serious disappointment, the production is awful on much of it. I suppose I should buy it and stop streaming it and take ownership and buy it so I’ll give it more of a chance. A physical copy would help that but I can throw the money at an mp3 album if that’s all I’m going to get the chance to have. I don’t know about all these country girl goblins and saloon shape shifters. Other than that it’s pretty good, but nothing sticks out yet like some of the great songs off the last album. Maybe it’ll grow on me and Carl. Solid band with good songs and an even better live show. Makes me feel better about me beloved Texas/Red Dirt scene is headed with newer generation of artists! You know, this site does bring to my attention some great music. But why in the hell are y’all so fixed on downplaying the songs as much as possible??!! The steel woods album was dramatically better than the review on this site. This album, that album, and many others receive so much undue criticism from whoever makes the reviews. This is annoying. Spread the music, don’t trash it. I appreciate your concern. I take an old school approach to writing reviews, which is completely foreign to today’s music coverage, but is steeped in the traditional of writing fair and constructive criticism as part of the creative process. This is very common in movies reviews. This is very common in sports. Political media coverage is all about criticism. However true artistic criticism has been bled out of music to the detriment of the medium. I believe this is one of the fundamental reasons there is so much bad music these days. The reason I pointed out the production issues with this record is because I want the next Flatland Cavalry record to be better. If nobody is honest with them about it, it won’t be fixed, and they won’t be able to reach their potential as a band. And lucky for them, this is a very fixable problem. Also, by reading the other comments, clearly I am not alone in this criticism. What bad music getting good reviews are you referring to?